It seems that many rewards cards today try to restrict the way you redeem your rewards, forcing you to choose between either cash back, merchandise, or miles. 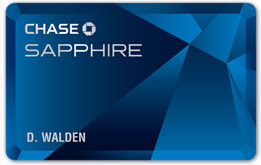 The Chase Sapphire card is strikingly different. Cardholders have the flexibility to redeem their rewards points on just about anything-hotel rooms, airfare, or simply cash back. Alluring sign-up incentives and decent card terms make the Chase Sapphire card a cut above the regular plastic. Oscar Wilde once said, “I can resist everything except temptation,” and the Chase Sapphire card certainly is not lacking in that department. With 10,000 bonus points after your first purchase and no earnings cap or rewards expiration, the Sapphire makes it hard for even the most disciplined individual to say no. The Sapphire card boasts a low 12.24% APR on purchases and balance transfers, has no annual fee, and earning one point for every dollar spent gives you the ability to rack up points to choose a reward(s) that truly suits you. The Ultimate Rewards program is one of the most generous rewards programs out there today. With no points expiration or black-out dates, if you can dream it, Chase will make it happen. Ever wanted to swim with dolphins? Treat that special someone to a VIP concert experience? How about a five-star dining experience to spoil your family? By using the Sapphire card, you can turn an ordinary day into an extraordinary one that won‘t soon be forgotten. Many of the events offered through Ultimate Rewards are exclusive to cardholders, making each excursion truly one-of-a-kind. Racking up rewards points is as easy as swiping your card. Earning one point for every dollar is great, but when you shop within the Chase online mall portal that has over 300 merchants, you have the potential to earn up to ten points per dollar spent. You can even earn double points when you book your airline seats through the Travel Booking Tool. But worry not. If travel rewards aren’t quite your thing, you can redeem your points for gift cards to spend at your favorite stores. Rewards start at $25 for 2500 points. Or you can even choose to “pay yourself back” by using your points for a statement credit. In addition to the Ultimate Rewards program, the Chase Sapphire card has all the attractive features people have come to expect from Chase. The features include Trip Cancellation and Travel Accident Insurance, Auto Rental Collision Damage Waiver, Zero Liability for fraudulent purchases, and a personal concierge. One of the best features included for wielding the Sapphire card is the ability to talk directly to a customer service person. By calling the number on the back of your card, you instantly are connected to a live person instead of “Pressing 3 to…” Chase also gives its cardholders extra peace of mind if their card is lost or stolen. They will expedite a replacement card to you and even arrange emergency cash for you until your new card arrives. For those that like to keep a close eye on their finances, the Chase Sapphire also comes standard with Blueprint. By using Blueprint, you can decide how you’d like to pay down those larger purchases and watch your balance drop. Chase also sends you a year-end report, organized by purchase type. This easily helps you track your spending for the past year as well as making filing your tax return that much easier. Unfortunately many of us will never have the opportunity to enjoy the luxuries this card has to offer; it is designed for those in the top 15% of household earnings. Even still, it is an excellent choice for those who do qualify, giving them the chance to make their every dream come true. As for the rest of us…well, we can still browse, right? "Unfortunately many of us will never have the opportunity to enjoy the luxuries this card has to offer; it is designed for those in the top 15% of household earnings." In my opinion those in the top 15% of household earnings won't even NEED this rewards program, as good as it may seem. Why would they? I think Chase should expand this rewards program to others as well, so lower income people can also benefit, even if Chase must lower the rewards. I know the type of people this card is intended for. This is an incentive to spend and a rebate for extra sending using the card.Chase makes money on big ticket purchases because merchants have varying agreements to the fees they pay for bit ticket items. But also, these are the kind of people who think it's a "deal" to get an extra night in a hotel suite that costs $4,000 a night. once you start playing with numbers like that, using a card is almost pointless. if you have that kind of money, only incentives to charge it will make you use the card. Chase knows that and would rather take a slice of the big spenders than provide microloans or anything for the little guy. i have Chase and my dollars go for those "points".